Is MillionaireMatch.com really the home for single sugar daddies and mommies? It certainly appears so. A while ago, fresh in his sobriety, Charlie Sheen was a member for a few months. I’m not sure if that is a selling point or not. All the same, the media seems to love this site. At one point, singles were really into it. Recently, though, the number of visitors has declined to a modest amount. You can verify your income by sending in copies of a tax return or bank statement along with your driver’s license or passport. You can upload the info online or remit it by fax or snail mail. You don’t have to have a million-dollar salary to certify your income of course. It doesn’t seem to offer any photo verification option, though. You also have the option of simply choosing “no” in the dropdown menu for the millionaire field on your profile. That’s it for anything remotely remarkable about the site. I’ve seen many sites in the same niche with similar services. They often let members verify their photos too. MillionaireMatch is rather plain and simple. Its design is not glitzy. I don’t even find it that aesthetically pleasing. I could be diplomatic and call it down-to-earth looking. That’s being generous in my assessment, though. When it comes to search options this site holds its own with most other dating sites. Until you pay, you can only search to a radius of 100 miles from home. Once you upgrade, you can narrow it down to 50 miles of a zip or postal code. You can also use all of the additional criteria filled out when you create a profile. You can also use chat rooms. You can initiate instant messaging and emails. It is free to reply to messages. More free features include blogs and members’ forums. What’s great about posting in these areas is if your posts are popular enough, you may win free premium access to the site. There are many other ways to earn full access to the site detailed in the FAQ. I’d say this site lets you check out enough stuff before deciding to pay. That’s important, because the membership is rather pricey. 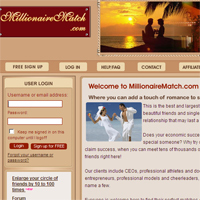 Millionaire Match is an expensive site with rather extensive dating services.